Updated: After careful consideration, I’m retracting my B and replacing it with a C-, penalizing Facebook for superfluous complexity and a lack of transparency. I wrote the original article on Wednesday evening, after attending the press event, carefully reading the company’s blog post, comparing notes and talking to several Facebook representatives. While the following information is correct, Facebook did not fully explain that there are three different stages to “opting-in.” We talked to Facebook on the phone today, expressed our concern, and they acknowledged that there was a lack of clarity. Facebook is currently making a demo video to properly address these privacy issues. In the meantime, Jason Kincaid has delivered a must-read explanation of these three opt-in stages here. Less than one hour after Facebook struck the ceremonial gong, signaling the official birth of Places, the ACLU of Northern California was ready to cry foul play. In a 429-word post titled, “Facebook Places: Check This Out, Before You Check In,” the ACLU branch rips the new feature for a perceived lack of user control, complaining (in dramatically bold font) that “in the world of Facebook Places, “no” is unfortunately not an option.” While this anonymous ACLU member may have a real knack for writing movie trailers, I don’t buy the case they’re building against Facebook. To be honest, I’ve never been a fan of Facebook’s history with privacy, but they are making a real effort to dial up privacy with Places. So while all sins are not forgiven, let’s start with a solid B for Places and a promise not to burn them at the stake (at least not today). First, let’s walk through what you need to know as a user (this post is updated with further clarification from Facebook’s Director of Policy Communications, Barry Schnitt). Facebook will not automatically broadcast your location data on Places. 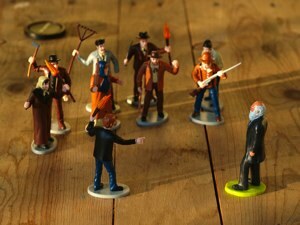 You cannot pass go, you cannot collect $200, until you give Facebook the greenlight. As a first time user, you have to check-in yourself via the iPhone app or touch.facebook.com or your friend has to check-in for you. If your friend tries to check you in, you have two options: pick “not now” or to accept friend check-ins (as implied, once you select yes, you will automatically accept friend check-ins). In their Places guide, the ACLU brings up the valid point that if you pick “not now,” you will continue to receiving annoying check-in requests every time a friend tags you. 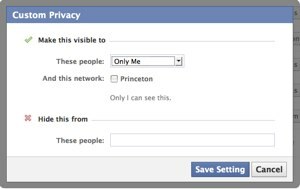 Of course, there’s an easy fix, simply go into your privacy settings, click on “customize settings” under “Sharing On Facebook,” scroll down to the second section (“Things Others Share”) and switch “Friends Can Check Me Into Places” to disabled. Places will tell you when your friend has checked you in. 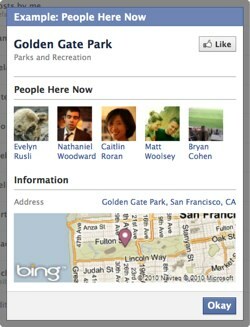 Similar to photo tags, you will be notified every time a friend checks you in. And like photos, you can untag yourself. The ACLU and other critics are wagging their fingers at Facebook for automating this process and not giving the user the choice to accept or reject every single request. Facebook had to make a judgment call here, between enhancing control and making the experience easy and enjoyable. As a new user, I would be frustrated by a service that demanded my attention for every friend check-in. Of course there is a chance that a rampaging ex-girlfriend or arch nemesis will exploit this tool to slander your good name, tying you to trysts that never happened or houses of ill repute—- then again, there is that nifty difty defriend option. Here Now is not the devil. This is probably the most controversial aspect of Places. The feature is enabled by default if you have loose privacy settings, however, it is not enabled if you’ve set your master privacy control to Friends of Friends or Friends or if you’ve customized your settings to be restrictive. The default is friends-only. When you begin completing and accepting check-ins only your friends can see your activity, not your friends or friends or your college network, just your friends. I can’t really give Facebook a lot of credit for this one, it’s just good common sense. Under your privacy settings you can customize this further, even selecting which friends can see your check-ins. Considering the sensitivity around location, I think Zuckerberg & Co. recognized early on that any default less than “friends only” would be an open invitation for privacy sharks. Your apartment is safe. During the press conference, someone asked the Facebook team what would happen if someone turned their apartment into a “place” on Facebook, how could they protect their privacy in that situation? We spoke to Facebook Product Manager Michael Sharon who says the company has a strong system in place to rapidly accept complaints from users. While there is no set time frame for handling a red flag, he says problems will be dealt with swiftly and often within 24 hours. See video below. I completely agree that it will ultimately enhance applications (and Facebook’s bottom line) but this should be an opt-in service. For example, when you first check-in or accept check-ins, Facebook should immediately ask you if you want to give your friends’ applications access to your check-in data. To be fair to its users, Facebook needs to increase the visibility of this feature. Because nlike the other settings, like Here Now, this exchange takes place in the background and I suspect the vast majority of Facebook users will not know that their data is being quietly siphoned off by their friends’ applications. If after all this you’re still thrusting your pitchfork in the air, you can always click here. Bonus: On Wednesday, we also got a chance to sit with Sharon for a longer, 5-minute interview. He discussed the story behind Facebook Places, the importance of tagging and navigating their partnerships. More information can be found on Facebook’s blog post here.